Looking for Handicap Parking Signs? Are you looking for handicap signs for your parking lot? Look no further than The Sign Studio, your premier sign company for all ADA compatible signs. 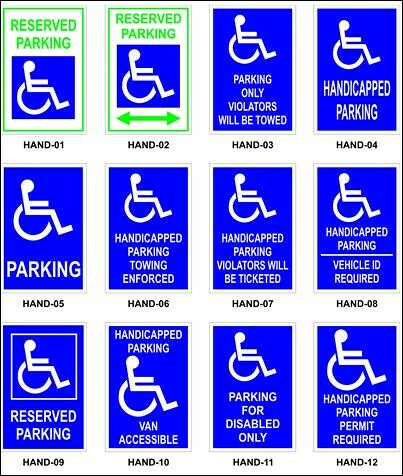 Requirements for handicap parking signs change regularly including how many signs parking lots need, the style of lettering required on the signs and the use of decorative elements. Before you install or upgrade your parking lot signs, make sure you work with a sign company who has experience creating and installing signs for handicap drivers. At The Sign Studio, we have been making ADA compliant signs for many years. We use state-of-art, computer-aided sign making systems and techniques to make our signs and provide our clients personal attention throughout the sign making process. When you choose The Sign Studio for your handicap signs, you have chosen a trusted vendor who knows the requirements of ADA signs. If you have any questions or need further assistance with anything, please give us a call at The Sign Studio (818) 843-9200 or send us an e-mail at info@signstudiola.com.